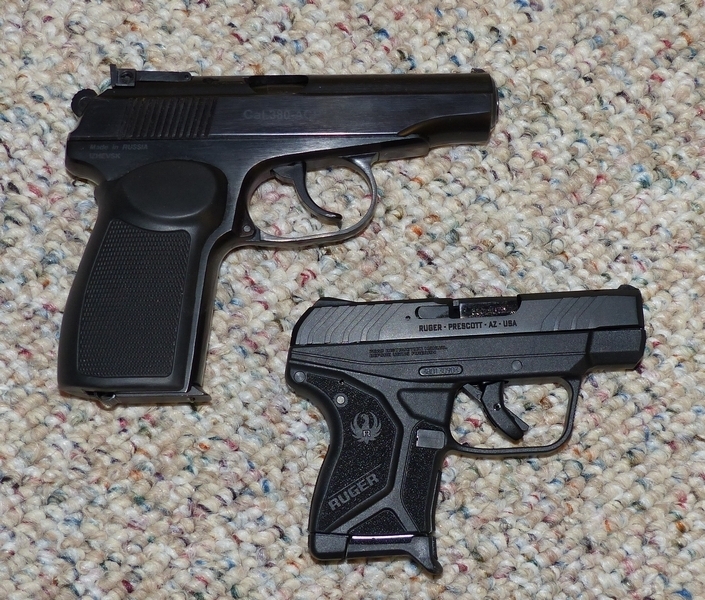 Above, the Makarov .380 on the left compared to the Ruger LCP II. Ruger has made several improvements to their well-received, popular, and affordable LCP, renaming it the LCP II in the process. At $349 retail, I've seen them at a wallet-friendly $275 street price. It is a true flyweight pistol at under ¾ lb. unloaded: 10.6 ounces. One 6 round magazine is supplied (yes, I wish it was two) along with a pocket holster. The most important and welcomed change, to me, is the trigger. After the initial take-up, the Glockish “safe action style” of trigger breaks crisply and cleanly. It is a very long way from the mile-long double action only triggers that make you feel like you are pulling on them all day. The trigger guard is a bit larger than on the original by now decade old LCP, with a coarser texture to the grip which is slightly wider and more comfortable. The Barnes TAC-XPD 80 grain .380 round is my favorite for a pistol of this genre, offering 12 inches or so of penetration. The Hornady 90 grain Critical Defense round is also excellent, for a .380 that is. Certainly, there are more potent cartridges than the .380: there is no question about that. The point of this pistol is easy of carry and conceal-ability, with no aspirations of being a target handgun or a .44 Rem Mag. This isn't my favorite pistol platform: is it truly anyone's? Nevertheless, Ruger has done a very good job here for what a .380 has to be, particularly when constrained by diminutive size and weight. The slide locks open on the LCP II, it is a better mannered handgun than the original. Although there isn't a lot of grip to hang on to, it is sufficient for its purpose as a deep concealment or backup pistol for close-range defensive purposes . . . and that's all anyone can rationally expect. Ruger's LCP II is a pocket pistol, with pocket pistol applications and capabilities, and it serves this particular niche quite well.